This week took a lot out of us. There was something in the air, it seemed; two participants had to be taken to the nearby clinic. The first was suffering from malaria and typhoid, the other from just malaria. Additionally, my cpap started giving me trouble, J.D. got a sinus infection, and several other members of the team just felt crappy. It was chilly, too, which is completely unexpected; the rainy season recently ended and the temperature is supposed to rise during this time. It’s never rained in Gitega while any of us have been there before; the same storm brought snow to places in Kenya that have never seen it. It’s our fault for bringing snowmen (the word in German happens to be Schneemann). Now for the good news. This week, instead of counselors, the team taught pastors, a couple of whom we saw at church. From what I heard, the pastors were just as invested in the training as the counselors were last week, and they asked questions that Kirk, Judi, and J.D. found challenging and astute. One man, Roger, made it his business to argue as best he could frequently and with gusto. Understandably, it grew increasingly annoying as the week progressed, but debate covers more information than teaching on its own. It’s also good for the participants to see that the teachers are comfortable enough with their material that they can field challenging questions on the fly. Every day, more little kids came. We didn’t have a single day with the older kids where everyone was on time and all the same kids came, but that just means our teaching reached a diverse audience. There were kids that came every day, and only on the days they were supposed to, as in theory we were alternating two groups. In the afternoons, the number only kept growing. Thursday, the last day of business as usual, our total number passed ninety. It was more than our original schedule could handle, so we shifted accordingly (more on that later). Flexibility, after all, was the name of the game this trip. On the last day for each of the groups, Bain talked the ones that expressed interest through accepting Jesus’ sacrifice for themselves and explained the responsibility that that comes with. Many prayed with him; it was beautiful. Friday, the THARS staff saw to a celebration that included both halves of the team on Friday. All the pastors and ALL the kids packed into Gubganeza’s new dining hall. The structure, bathrooms, and kitchen are all finished, though the huge dining area isn’t yet. Johana, Gubganeza’s fundi (handyman), and J.D. 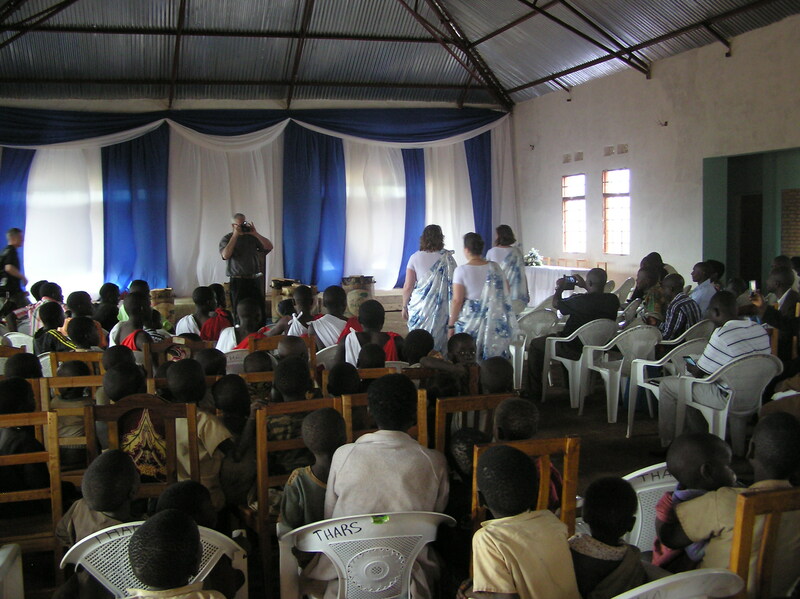 (also a fundi) worked together using power tools we donated to build a small stage at one end and a great many chairs were set up facing it. Everybody was served lunch (a great deal of beans and rice) and given a Fanta. It gave us great hope when the pastors started serving the kids with us; one of the main themes behind the pastors’ teaching was servant leadership. The pastors also learned a lot about respecting women and the places that’s in the Bible. Once everyone was fed, the kids and Chris, Heather, Lydia, Ginger, and I got up on stage and showed off the dance we’d taught them: The Cupid Shuffle in Kirundi (ibugo, ibugo, ibugo, ibugo…). We heard kids singing it from across the valley that night. Next, each pastor was given a certificate of completion signed by J.D. and David, and they all looked so proud. Many haven’t received any formal recognition of training before (as not many have completed school or gone to university), so to watch their pride at this graduation was truly special. Many photos were taken. From there, THARS turned it on us and recognized the team. They’d prepared handmade gifts for each of us, and they were all different. The men received canes, a Burundian symbol of leadership and long life. The women who’d participated in leading worship at chapel each morning received a simple traditional stringed instrument, painted beautifully with unique designs. Vickie received a shield, a symbol of her job defending the productivity of the team. Two pastors and Clovis (who’s definitely going to be a pastor) had verses and a prayer for us. There really aren’t words to express how blessed I feel by these people, people who we poured our hearts into blessing ourselves. There’s a reason these trips stick with us for so long: Africa never lets us leave the same person we arrived.